Short Description of Biosand Filters and Latrines Installed: In Germania, 36 families needed a bio-sand filter and only 28 needed a latrine. The 6 remaining families already had latrines which were in good condition. In Los Angeles, 47 families received bio-sand filters and only 40 needed a latrine. 2 latrines where built at the school, one for boys and the other for girls. 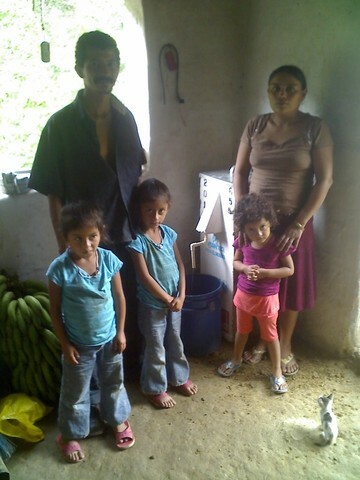 In the community of Buena Esperanza, 34 families received a filter and only 26 needed a latrine. All of the beneficiaries received a workshop on personal hygiene, environmental hygiene, hand washing, home hygiene, and filter and latrine usage. Also in every community, community agents were trained in the use and maintenance of the filter. PWW also trained the teachers in proper hand washing techniques, and personal and home hygiene. They then work with their students to teach these practices. PWW was accompanied by a nurse from the local health center who gave the de-worming medicine to all of the beneficiaries. Each community has its own story, but the common denominator regarding health is that diarrhea is a reoccurring problem and that children carry the heaviest burden. Some families mentioned that the rainy season brings more sickness while others told us diarrhea may strike at any time. Stomach pains and parasites were also common problems affecting those from 2 to 45 years of age. Before the biosand filter project, residents drank water from unprotected springs or stream water brought to each house via a rubber hose. Now before drinking, most residents filter the water through a cloth to remove any plants parts or other solids that come included with their water. This water is then filtered through the bio sand filter. Another common factor that most families had in these 3 communities before our intervention was that families used their surrounding land to take care of their physical needs. Furthermore, all residents dug the holes for their flushable, double-pit latrines that where built by residents and PWW staff. Buena Esperanza: “2011 is really going to be a Happy New Year, now that we are going to have a filter and a latrine in our home” said a small boy in Buena Esperanza while he was helping his dad and the health promoters during the construction of a latrine in their home. In all three communities the families have been following all the operation rules of the biosand filter correctly. We also took a water sample which confirmed the quality of the filtered water. Azucena a mother of five said she has seen the results of the filter in the health of her children. “The kids used to get diarrhea, but not anymore,” she told us. In addition to correct filter use, safe water storage is critical. We gave each family two containers- one for collecting the filtered water, and another with a lid and a spigot. With these, families could store the filtered water and we were happy to see it practiced in about every occasion in all 3 communities. In Germania: One of mothers in Germania was recently calling her daughter to come eat dinner, telling her to hurry up. “Wait, wait,” the girl answered. “I have to go wash my hands, the right way!” She was meticulously following the steps she had learned in the Pure Water hygiene training, scrubbing her palms, the backs of her hands and in between her fingers just like she’d learned from Karla, a PWW health promoter. The project in these communities is nearing completion with latrines in Los Angeles being the last to complete. The information gathered for these three communties was obtained by UNICEF. Due to community changes since UNICEF conducted the surveys, 94 latrines were needed instead of the initial 110. The adobe latrines were not suitable in these communties,as it took too long for the material to dry resulting in the lack of sustained interest from the people. Instead, the concrete and sheet metal materials were used. These changes to the original plan - the lower number of latrines installed with the slightly more expensive materials - it is expected that it will have little impact on the budget. PWW staff and community members are continuing their work to complete the project shortly. In the communities of Buena Esperanza and Germania the Pure Water staff has been able to install 54 latrines (26 in Buena Esperanza and 28 in Germania), benefiting 146 people in Buena Esperanza and 148 people in Germania. In all three communities the community members have participated in hygiene and sanitation workshops, environmental education, hand washing in school, de-worming campaigns, and they have received proper safe water containers. The community Los Angeles is one of the farthest and with the most difficult access due to road conditions. Due to the rain, the installation of latrines has been delayed. It has also become very difficult for the beneficiaries to get proper sand for the concrete mix for the latrine slab. All of the superstructure material has been delivered to the beneficiaries in Los Angeles. The staff is waiting for the rain to stop for start work on the slabs for the latrines. PWW staff is currently working in the community of Los Angeles. Access to this community is very difficult during raining season due to bad road conditions. The staff members were able to deliver material for 40 latrines and install 10 latrines. Due to the rain they haven’t been able to deliver the cement or work on the latrine slabs for the remainder fo the latrines. However, this program is still on track to be completed at the end of June 2011. Despite the heavy rains and poor road conditions for traveling to the community of Germania, PWW staff was able to install 28 latrines there in the past few weeks. In this community 148 people now have a bio-sand filter, and a pour flush latrine. A de-worming campaign and educational workshops were also held in this community. These workshops covered the following topics: use and maintenance of the biosand filter, use and maintenance of the latrine, personal hygiene, environment hygiene and sanitation and a Community Agent workshop. The teacher and students also received a hand washing workshop. For this proposal, the community of Buena Esperanza is the first to be completed. All the families have received their bio sand filters (a report on this will be submitted shortly), latrines, hygiene trainings, and de-worming medicine. Community agents have been trained to assist with filter maintenance and to monitor the filters and proper hygiene practices. Prior to the project, open defecation was practiced by many households as only 10 families had latrines. 26 latrines were installed and now all families have access to proper latrines and they have received the training necessary to follow proper hygiene practices such as hand-washing, latrine maintenance, protecting water sources and other items. From this one community, 36 families have received bio sand filters, latrines and hygiene training. They also participated in the construction of their latrines and the hygiene and sanitation. Originally we had a census on all three communities from UNICEF which stated that 117 families needed a bio sand filter and a latrine. When the project was approved and we started our work, we learned that 16 families out of the 110 that had said they needed a latrine already had latrine. Because of this, the number of latrines decreased to 94. However, as stated in a previous progress report, PWW changed the latrine design from adobe, to a double pit latrine which used concrete on the base and sheet metal for the frame. This change increased the cost of the latrines. This project was also delayed due to road and weather conditions. While most of these communities are only between 25-30km from the PWW office in Trojes, a one-way trip on a motorcycle can take anywhere from 1-3 hours, depending on the weather conditions. In fact, if it’s raining, the road becomes so slippery that even staying upright on foot can be a challenge let alone trying to get a motorcycle up a mountain! Nonetheless, however work has to be done and it has to be a slow and risky journey during rainy season and our team manages to arrive safely on every occasion.